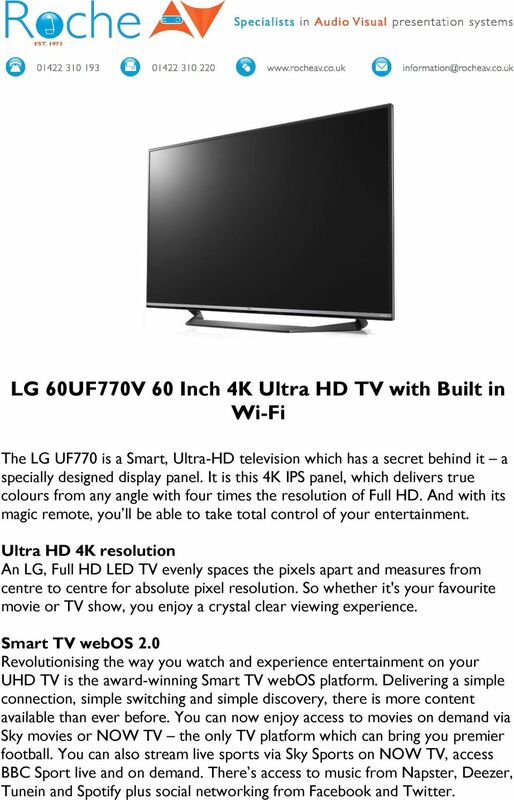 Download "LG 60UF770V 60 Inch 4K Ultra HD TV with Built in Wi-Fi"
1 LG 60UF770V 60 Inch 4K Ultra HD TV with Built in Wi-Fi The LG UF770 is a Smart, Ultra-HD television which has a secret behind it a specially designed display panel. It is this 4K IPS panel, which delivers true colours from any angle with four times the resolution of Full HD. And with its magic remote, you ll be able to take total control of your entertainment. Ultra HD 4K resolution An LG, Full HD LED TV evenly spaces the pixels apart and measures from centre to centre for absolute pixel resolution. 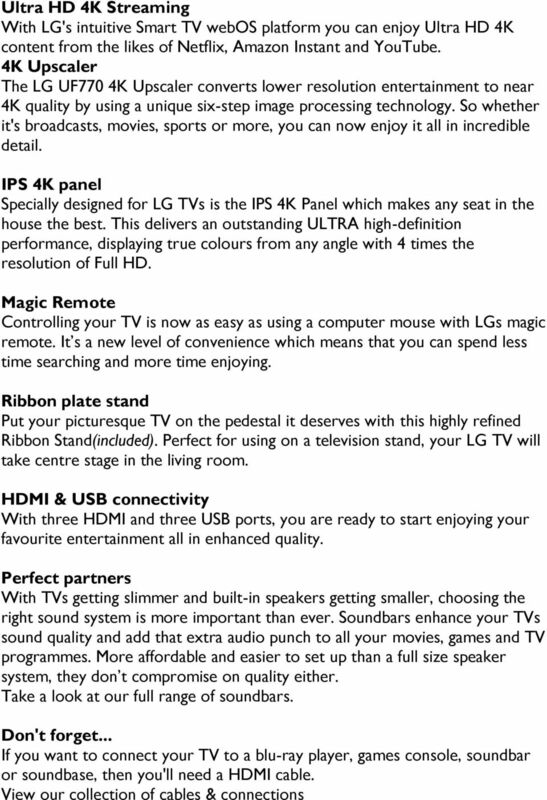 So whether it's your favourite movie or TV show, you enjoy a crystal clear viewing experience. Smart TV webos 2.0 Revolutionising the way you watch and experience entertainment on your UHD TV is the award-winning Smart TV webos platform. Delivering a simple connection, simple switching and simple discovery, there is more content available than ever before. You can now enjoy access to movies on demand via Sky movies or NOW TV the only TV platform which can bring you premier football. You can also stream live sports via Sky Sports on NOW TV, access BBC Sport live and on demand. There s access to music from Napster, Deezer, Tunein and Spotify plus social networking from Facebook and Twitter. Smart TV. 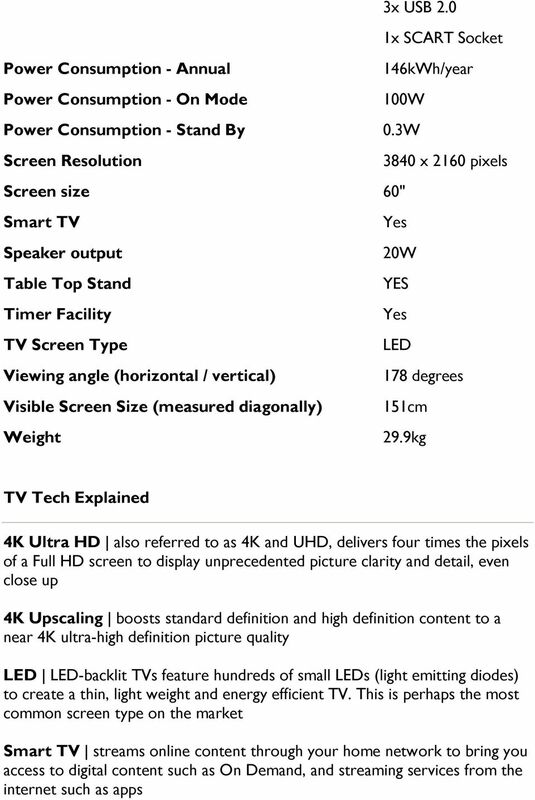 151 cm diagonal resolution UHD. to surf the Internet, HbbTV technology Bluetooth technology large-screen display. PRODUCT HIGHLIGHTS Smart TV Wi-Fi Built In Motion Rate 120 SIZE CLASS 65 UN65J6200 60 UN60J6200 55 UN55J6200 50 UN50J6200 48 UN48J6200 40 UN40J6200 With the Samsung Smart LED TV, Smart is only the beginning. 65EG9600 65 65" curved Smart OLED 4K Ultra HD TV UN75JU7100F Compare At $7,699.99 $4,299.00 Save $3,400.99 75 75" 4K Ultra High Definition TV UN75JU7100F Compare At $4,999.99 $3,999.00 Save $1,000.99 75"
J6200 LED TV SPEC SHEET PRODUCT HIGHLIGHTS. Smart TV. Wi-Fi Built In. Motion Rate 120 SIZE CLASS 60" 65" 55" UN65J6200 UN55J6200 UN60J6200 50" 48" 40"
DATA SHEET STREAMING HUNDREDS OF HD CHANNELS ON YOUR TV. It comes with HDMI-RS232C converter box which enables external control of the display, for features like volume control and more. on LED, LCD, OLED & Plasma! in association with TVs do much more now Flat screens were just the start. The humble TV is transforming in all sorts of ways and fast becoming much more than just a gogglebox. Create public display and signage applications that stand out from the crowd in Full HD resolution, with superb colour and contrast. Sony Wireless Home Theatre System DAV-DZ870KW DAV-DZ870KW Hong Kong, May 7, 2008 - Sony Corporation of Hong Kong Limited today introduced a new model to its wireless home theatre system series - DAV-DZ870KW. 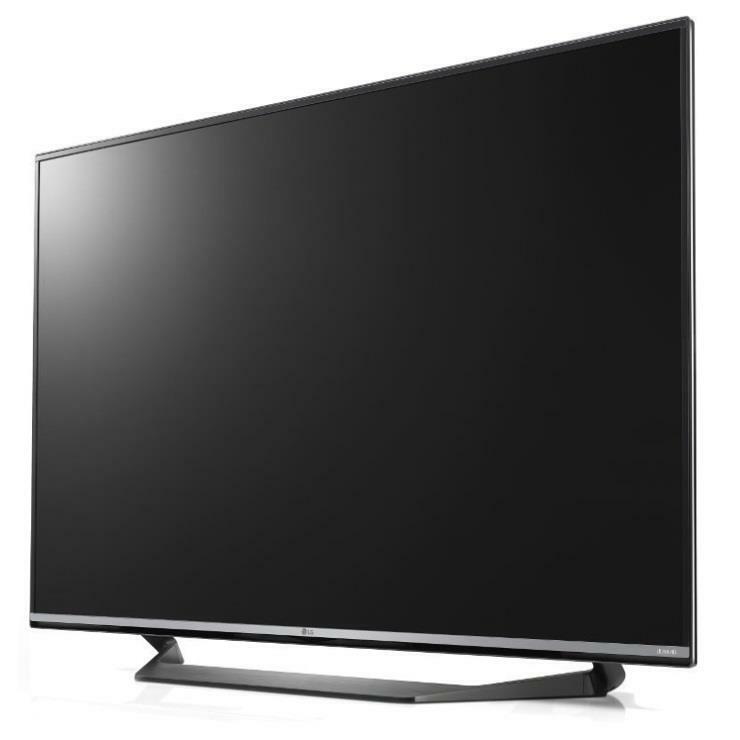 Absolute flat screen With the LCD TV s perfectly flat screen, picture distortions owing to screen curvature are a thing of the past. Manufactured under license from Dolby laboratories. 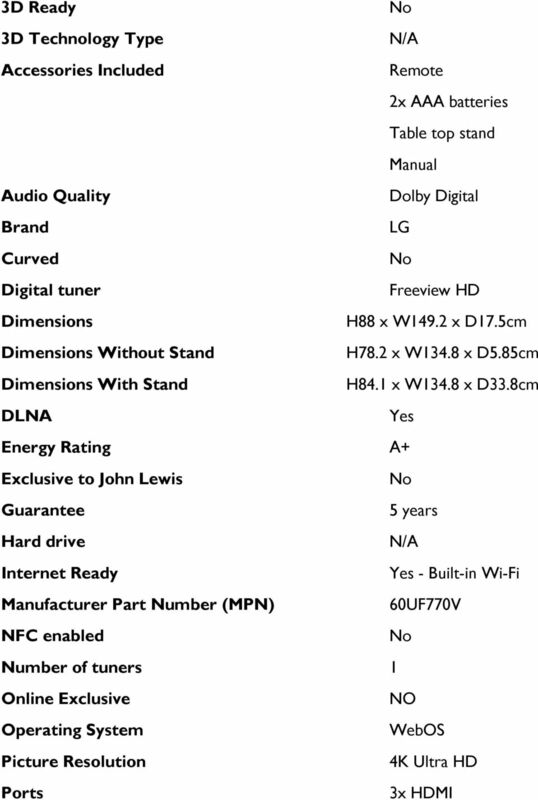 Dolby and the double-d symbol are trademarks of Dolby Laboratories. MediaQ M310. Quick Start HUAWEI TECHNOLOGIES CO., LTD.
Kindle FreeTime on Kindle Fire HD 7"
FWL-75W855C 75" BRAVIA Professional Full HD Colour LED Display Overview Full HD picture quality and Android TV for corporate, education and digital signage applications This slim, energy-efficient 75"
Laser Series. Laser. Leddura Lexinus Mensa. 84 inch UHD. Smart innovation! For when function matters. Getting Started Technical Support Thank you for selecting NETGEAR products. After installing your device, locate the serial number on the label of your product and use it to register your product at https://my.netgear.com. E-MANUAL. Thank you for purchasing this Samsung product. To receive more complete service, please register your product at.